Created at the ESP facility in Tokyo, Japan, the ESP E-II Series is our highest-quality factory-produced instrument collection. With the E-II Eclipse EverTune, you get one of the most finely-crafted guitars imaginable, with a unique set of components designed for serious musicians. It features the EverTune constant tension bridge, a fully-mechanical system that keeps your guitar in tune in nearly every imaginable environment, and keeps your intonation perfect at every point on the fingerboard. The E-II Eclipse EverTune also includes a set of phenomenal pickups: a Seymour Duncan Sentient in the neck position for wide dynamic range and excellent articulation, and an aggressive Seymour Duncan Pegasus in the bridge that's highly responsive and harmonically rich. The E-II Eclipse EverTune is a set-thru neck design, with a mahogany body, a one-piece mahogany neck, and an ebony fingerboard with 22 extra-jumbo frets. Top-tier components include a Schaller straplock, Gotoh locking tuners, and a graphite nut. 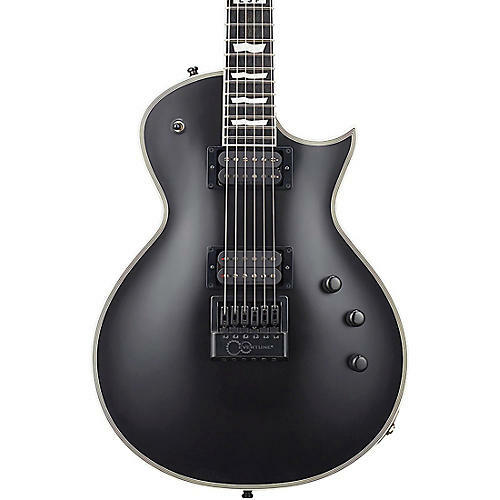 Available in Black Satin finish with multiple binding on the body, neck, and headstock.